Large or small scale moves need planning and co-ordination and continuity of workflow is essential with every business move. Outsourcing the project management for your relocation programme makes sound business sense, as it allows your key personnel to focus their attention on running the business at this critical time. We recommend a Project Manager be appointed at an early stage to help co-ordinate the wide range of tasks necessary. This liaison would be up to Director level; it also includes departmental briefings, support and communication and co-ordination with external contractors and suppliers. We understand the importance of technology in the modern workplace and a great importance is placed on the safe movement of I.T. equipment to ensure that your company can have a minimum amount of downtime. We will work with your staff or specialised I.T. department and after I.T. has been de-commissioned utilize Techno-Cartons and Anti-static bubble wrap sleeves to provide the protection required. Prior to re-commissioning in the new building we ensure that all equipment is unwrapped and placed on the appropriate desk. Protection of your building and the safety of your staff and visitors during a move is essential. Protection material can be applied to both origin and destination buildings as appropriate. We manage the whole process from supply to collection. Crate hire has a unique order number and we keep a detailed record of all deliveries and collections. Crates are placed in the designated areas by our delivery staff. 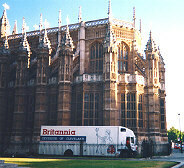 Most personnel undertake the packing and unpacking but we can provide skilled packers to undertake this task. The project Manager will be able to advise if any specialist equipment will be required for any unique pieces of furniture of equipment on site, such as fire proof cabinets or safes. We have a large array of equipment for most occasions but if the hire of specialist equipment is required we can organize this. Britannia has excellent facilities for storing your archived documents. Clients can choose a bespoke package to suit their needs were they control all aspects of the movement and management of the files to Britannia providing collection and retrieval services and updating of records.